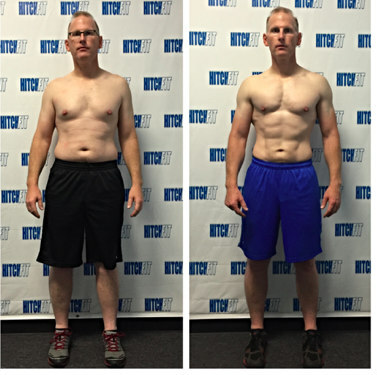 Overland Park Personal Training Gym – Get in Shape at Hitch Fit like Kurt! In sports, a time-out is a halt in the play. This allows the coaches of either team to communicate with the team, e.g., to determine strategy or inspire morale, as well as to stop the game clock. In our busy lives we often do not call time-outs we just keep pushing through the days that lead to weeks, months and years where the tendency is to keep dredging through a typical routine that over time leads to being overweight, out of shape and most likely taunting health concerns. In my case my time-out was not called by a coach, player or for a media commercial break it was initiated by someone I care very much for, my son Garrett. One Sunday afternoon shortly after Thanksgiving we were doing what most father-sons do to test competitive natures of men, we had a wrestling bout on the living room floor. Within a short period after having my son in a headlock he looks at me and smiles while he says “Dad you are fat!”. Wow, what a killing blow. I knew I was heavier than I wanted to be yet fat? I wasn’t ready for that yet I realized it was the best thing to happen to me as I definitely needed to hear it; it was my time-out. That evening I looked in the mirror thinking am I happy with the way I look, the way I feel or how my son and others may perceive me? No was the answer. The odd thing was that I have worked out off and on my entire adult life yet I can honestly say that I was never really satisfied with how I felt or looked. Willpower is something I am not short of as I feel that if I put my mind to something there is nothing that I am not able to achieve so making it to a gym every day was something I knew was not going to be a challenge. Although going to a gym and working out for an hour or more with no guidance or definitive direction on the right way to train was something I did not feel was needed. This time I wanted to put my pride aside and look for assistance by finding someone, a personal trainer, that would have my best interests in mind by knowing my body type, listening and learning from my goals and objectives, then applying those to a training schedule that allowed me to slowly transform into the person I wanted to be. 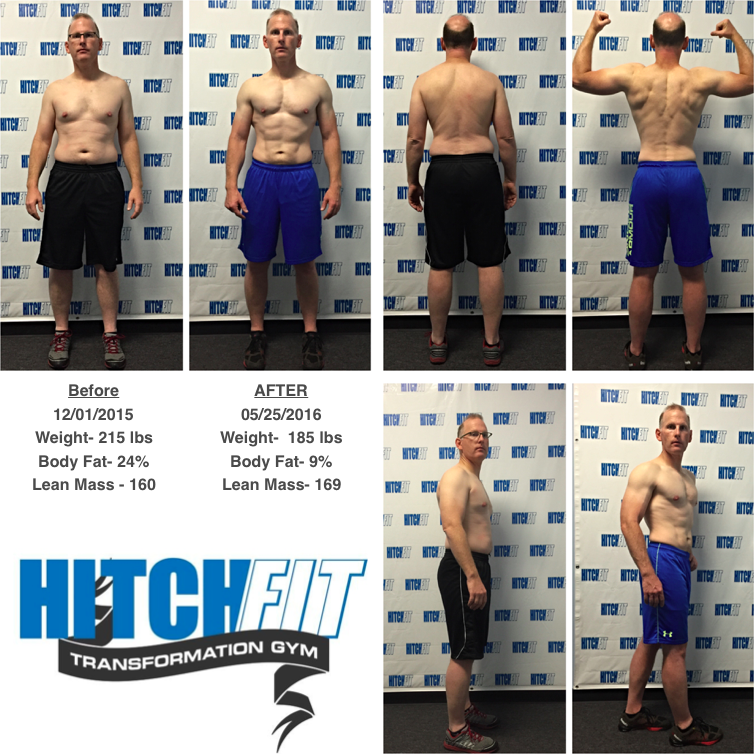 After doing some research I found Hitch Fit and was thoroughly impressed with the many transformation results I had seen by others and testimonials on the website. I was fortunate in that I was paired up with someone that not only shared my own name, yet was in a lot of ways very similar to me, same body type, personality, likes, etc. The first day I met Kurtis McLellan with Hitch Fit I was unsure of how long the journey was going to take as there is no overnight success as I knew the results were going to be dependent on me and my ability to stick with the program and trust in his judgment on how much he could push me to make weekly gains to meet my personal goals & objectives. More than anything he was an accountability partner through the process, always texting me during the day to see how I was doing with my nutrition, checking to see if I was sore, ask if I had questions or just say hello or what’s up. The journey was not easy yet 6 months later I had dropped 23 lbs., going from 24% body fat to 9% body fat and gaining 12 lbs. of lean mass. What I learned is there is a formula, one that I had not followed before where nutrition, cardio, resistance training and sleep, yes sleep, was all so important in seeing results. Today, I continue to drop weight, gain lean mass and am very thankful to Kurtis and Hitch Fit for making it all possible. Yet, the real credit should go to my son, Garrett, as he started the spark and for that I am forever grateful.